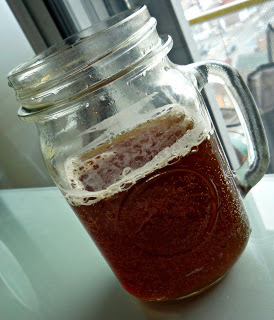 One of my favorite (not to mention easiest) kombucha experiments was Coffee Kombucha. I blogged about it (here and here) when I first did it but I figured it wouldn't hurt to bring it to your attention during this - the month of food. Brew coffee to the strength in which you would normally drink it. Add sugar while the coffee is still hot and stir to dissolve. Let coffee come to room temperature. Add SCOBY and ferment until the beverage suits your palate. Remember to check out my online Kombucha brewing course! Enter coupon code 'vegan' for free access! Purchase my zine on Kombucha brewing!